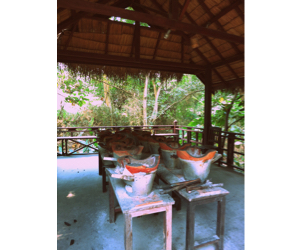 As what you expect in most Asian destinations, there is an abundance of cooking schools to choose from. We based our choice off the actual restaurant itself that the cooking classes were attached to. 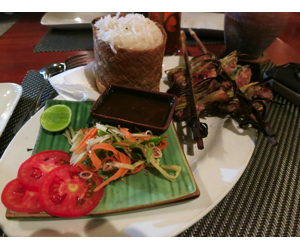 The restaurant was Tamarind and the cooking class was called Tamarind Restaurant's Cooking School. Every time we walked past the restaurant it was always full and reservations were highly recommended. The day we put our deposit down for the cooking class we also put our name down for one of the last open spots during their dinner service. 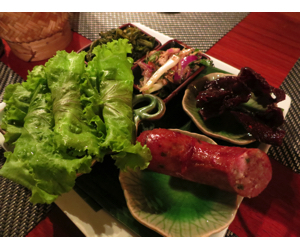 The restaurant itself had a great atmosphere, attentive staff and delicious Laotian meals. If the cooking class was as this high a standard, then we were in for a treat. This restaurant was definitely a higher standard than most that were in the area, but price-wise it was very reasonable and didn't break the bank. This cost us 280,000 KIP, which, back then, was equivalent to USD35. 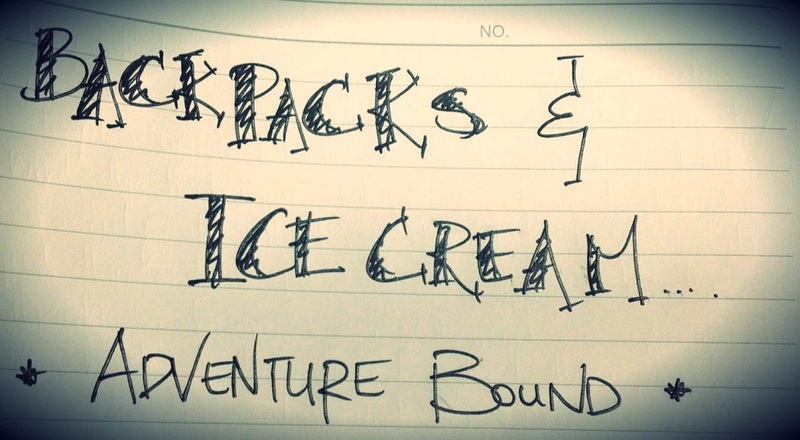 We did end up reserving our spot online first via their website, but required a deposit no later than a couple days out from the intended date. It looked like the max number in any group was about 12 to 15. We had 12 in our group. We were told to meet at the restaurant by a certain time. 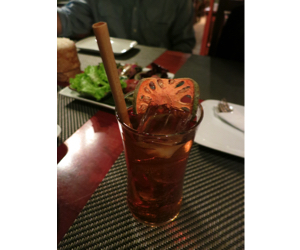 Here we paid the balance of our class and then was served Laos Iced Tea. 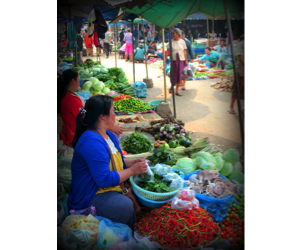 We were then taken by tuk-tuk to the morning markets; the largest markets in Luang Prabang. They sold all sorts of things from vegetables and spices to toys and socket plugs. 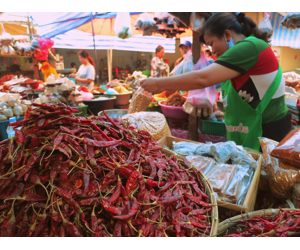 We were taken to certain stalls, ones that the restaurants directly deal with, and here there were explanations of what each spice, herb or vegetable was- how it could be used in cooking. We were also introduced to local Laotian snacks and taken through the meat section where our chef explained how locals eat nearly all parts of the animal. For example, buffalo meat. They will eat the skin, all the meat and the insides. Typically, the meat is quite gamey but the insides (being the liver, kidneys etc) are fleshier, healthier and tastier and thereby are more expensive than the meat itself. 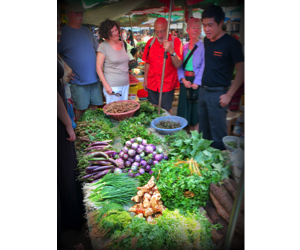 Once we were finished with the market, the actual location of the cooking school was another 15 to 20 minute drive away through local farm lands and fields. The set up is pretty brilliant and here they grow their own vegetables to use for the classes itself. 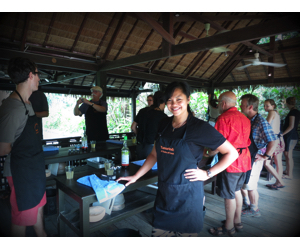 The owner of the Tamarind empire, Joy, was actually on site with us, which I thought was very neat. The chef did majority of the explanations but Joy was there to help on the side. They also gave us a quick background as to who Joy was and how he came to start up the school and restaurant. It was a very humbling story. 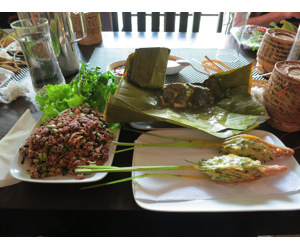 The class consisted of us cooking 3 main Laos dishes: Buffalo mince, Lemongrass stuffed chicken and Tilapia wrapped in banana leaves. For dessert we made purple sticky rice. The whole process was very interactive and the chef was very helpful and hands on. It was all explained very well and I think everyone in our group had a great time. Also, I think everyone was able to cook all the dishes without any disasters and we were all very satisfied at the end, and our hunger satiated. We were told to meet at 830am at the restaurant and we got back around 3pm. A very long day but well worth the time and money. They do also have a shorter option where it is their evening cooking classes and you just make one less dish.